Digestive Enzymes | The Devon Allergy Clinic | Buy Online! How Digestive Enzymes can help you beat the festive bloat. Christmas is just a stone’s throw away and the season brings lots of opportunities to over indulge, but don’t panic all this eating and drinking doesn’t have to cause havoc. I would like to help you to digest your food more efficiently – which will help you feel and look better during times of feasts and beyond. And, yes, good digestion prevents putting on those extra pounds as well! Win/ Win! As you may know, food and digestion is at the centre of our overall health and hormonal balance, but the phrase you are what you eat is now a little outdated, and should be “you are what your body can digest and absorb” after all if your digestive system is not working correctly you will not fully benefit from the nutrients in your diet, no matter how high the quality of your food. 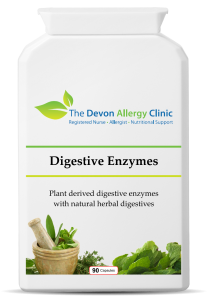 The Devon Allergy Clinic have a supplement that can assist with the absorption of our food – Find it here Digestive Enzymes. This is where digestive enzymes become a life-saver: You are giving your body what it needs to break the food down. For more information on allergies or food intolerances please contact us.